One of the defining characteristics of Big Finish's popular New Audio Adventure CD releases is that they feature the Fifth to Eighth Doctors only. This is mainly due to the First, Second and Third Doctors no longer being with us, plus Big Finish being unsuccessful (until recently) in persuading Tom Baker to participate. To rectify this gap, in early 2007, Big Finish released a set of 4 audios in a new mini-series called "The Companion Chronicles", one for each of the first 4 classic series Doctors. Unlike the rest of Big Finish's output, instead of being full-cast audio dramas, these are more like audio readings, since they involve just one actor narrating the story — in each case, the reading is "performed" by one of the Doctor's companions. 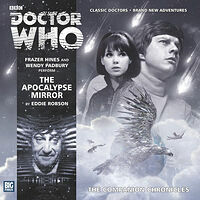 This proved to be successful, so further releases followed, and in July 2008 Big Finish announced that this was to become a regular monthly series, with two slight changes: The range was expanded to include companions from later Doctors as well... plus one extra actor was added to the cast for each audio, to give the audio more "depth" and reduce the strain of the companion having to carry the entire drama by themselves. After 2014, Big Finish stopped the monthly series of releases and instead switched to a pattern of releasing one audio box set per year.